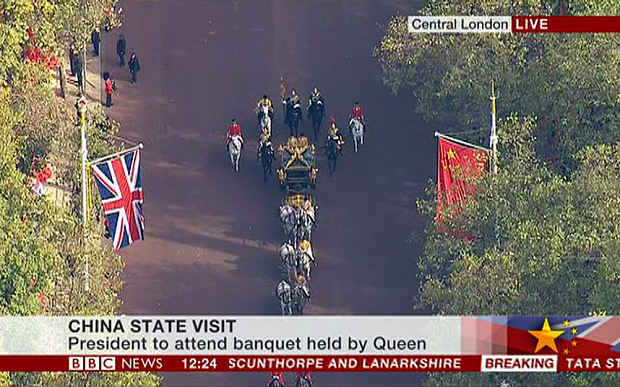 President Xi Jinping ad wife Peng Liyuan climbed into the horse-drawn carriage just a while ago today for the ride to Buckingham Place by the Queen and Prince Philip following a welcoming ceremony that included a 41-gun salute at Horse Guards Parade. 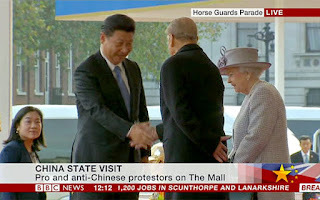 Both Chinese supporters and human rights protesters took to the streets of central London ahead of Chinese President Xi Jinping's official welcome by the Queen. President Xi Jinping and his wife Peng Liyuan were treated to an official state welcome by the Queen and the Duke of Edinburgh at Horse Guards Parade. It is the first state visit by China in a decade and the occasion will treated with all the pomp and ceremony that Britain could offer. 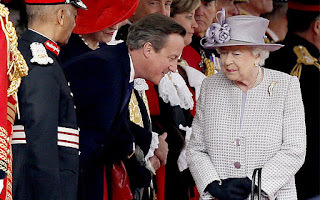 David Cameron and Theresa May, pictured below, were among the dignitaries, while some 1,100 troops were involved in the parade. 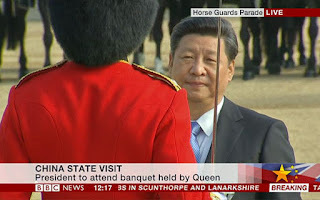 Xi Jinping was invited to join the Queen in a royal carriage which then headed down The Mall to Buckingham Palace where they, along with other dignitaries, are enjoying a private lunch. After the lunch, they will view an exhibition in the Picture Gallery of items from the Royal Collection relating to China. 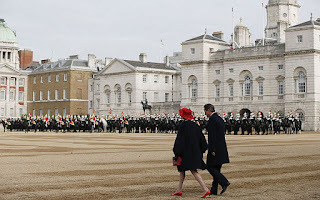 Before the Queen and president on Horse Guards Parade was a guard of honour comprising 96 rank and file men and three officers from 1st Battalion Grenadier Guards. 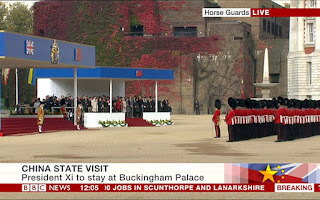 Major Benjamin Jesty, captain of the guard of honour, marched forward and presented his men giving the order in Mandarin. 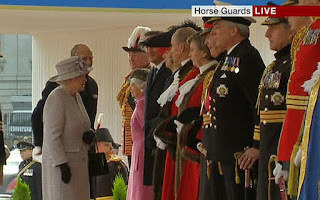 Speaking the language he has been practising for a number of weeks he said: "The Guard of Honour of 1st Battalion Grenadier Guards is present, formed up and ready for your inspection Sir". 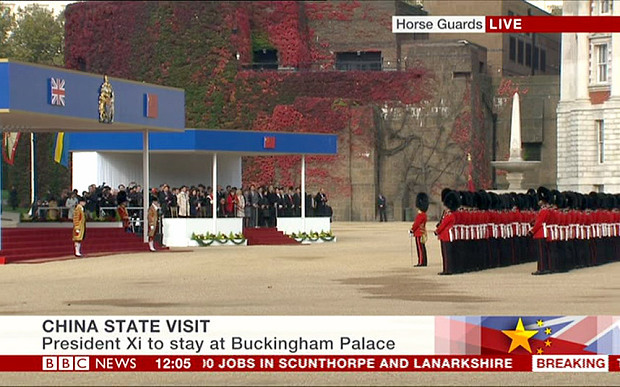 Prince Philip joined the Chinese leader as he walked past the two rows of guardsmen wearing their scarlet tunics and bearskins. 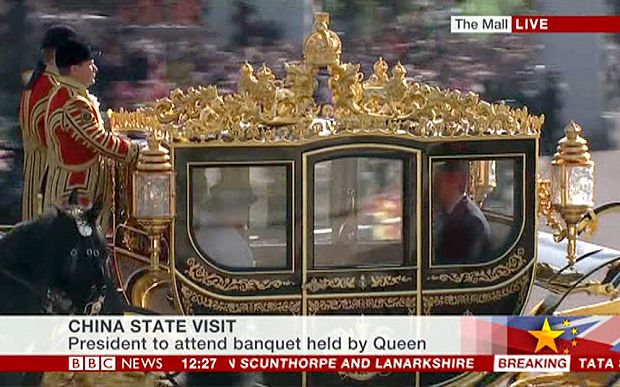 There are some 1,100 troops involved in this celebration. 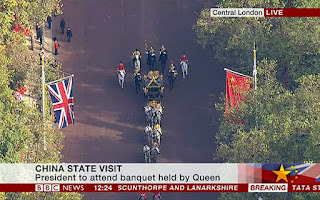 The Band of the Household Cavalry are providing the musical accompaniment for the ceremony which will run for around 20 minutes.